Many reviews on the book’s page on Amazon.com and on GoodReads.com. I invite you to post your thoughts about the book, too. If you find another review somewhere, please send it to me so I can post it here as well. “The Song of Increase” has been a “Bee Bible” for our family (and others) which I’ve enjoyed in small and large doses on a daily basis. It speaks a truth and wisdom about bees that is rarely heard. In doing so, it is deeply nourishing and affirming to the wonder of these beings. Soometimes at the start of our bee meetings, we read a passage from your book. It provided a wonderful foundation for a workshop I did earlier this year in Sweden. It opened us all to how amazing bees are, and how important it is to connect with our hearts and be grateful for all they bring for the earth. Thank you. I was just today reading about the mating flight. You have written one of the most spiritually wise books I have come across in a long time. This knowldege fits my own experiences, not just about the bees. For that I say thank you, thank you. Reading this book was a profound experience for me as a new beekeeper, but I think I would have felt the same if I didn’t keep bees. Ms. Freeman has the gift of a full and joyful awareness of the connectedness of all creatures. She expresses this knowing in warm, beautiful tones that reassure me – that in spite of the chaos in my head and in the world around me, Nature knows what she’s doing and it’s going to be OK. Although it is a highly spiritual book, it serves as a practical guide as well. It is in no way a “how-to” book. But it helped me with the most difficult part of beginning as a beekeeper: choosing a philosophy of hive management. So many of us are wrestling with these decisions, knowing deeply that the chemical and industrial techniques which have become the norm are somehow contributing to the troubles the bees face today. The point of view represented in The Song of Increase is one that often gets left behind. What do the bees think about it all? Whether or not you believe that Ms. Freeman has conversations with bees, what she speaks on their behalf rings true in every word. This book is a Gift. I wish I could give this book TEN STARS (not even kidding!! ), I so love it! It’s wonderful and amazing and delicious, all at once. I’ve told friends about it and of course they’re now enjoying it, too! It’s really quite beyond words to try and explain how it’s meeting me. I’m definitely awed by the bees’ messages, and totally resonating with and inspired by the information. Jacqueline Freeman has delivered what I’ve taken to referring to as “Holy Grail” level information. Do not miss this book if you truly care to delve deeply into what the Mystery of beekeeping is really all about. This book is one of a kind. You will find it unlike any other book on bees or beekeeping. It is not a how to or beginner beekeeping book. Instead it provides a delightful look into the lives and thoughts of the bees themselves. That may sound a little strange at first, how could one know what the thoughts are of bees? Well, just as there are horse whisperers and pet whisperers which communicate with animals directly through ESP, Jacqueline does this with bees. She is it seems a “bee whisperer”. Insects and other animals such as birds and fish have what is called a group soul. That makes them all connected at an etheric level. This can be easily seen by how birds flock and fish swim in schools, turning all at once in full synchronization. So although any individual bee may only have a few weeks of experience, the group over-soul will have trillions of bee years worth of experience. This is what she seems to be communicating with, although when she asks if a weak colony wants to be combined with a strong one, she is communicating with the colony itself. Interestingly most colonies do not want to be combined, but want to try to go it on their own. LIkely because that would end their genetic line. The insights of this book are nothing short of incredible. No longer are you faced with raw dry statistics which show that feeding sugar syrup decreases the bees’ lifespans, but you hear that it makes them feel bad, even giving them a tummy ache. The insights provided make one realize just how incredible and intellignet bees are. According to the bees, they do not want or like chemical treatment. They want to deal with things like mites themselves without help. They say that mites are not the problem, that treating for mites is. If the genetics cannot deal with the mites, then those genetics lines need to be removed from the genetic pool. Now it seems that no hive of bees would want to die because they are not well equipped to handle mites. But remember the communication is with the oversoul of ALL hives, and thus the broader view is that it is better to have some die so others can be healthy than to have all unhealthy. That the pips (brood), can taste and remember the pollen in their food to when they are adults is very enlightening. You can almost feel their joy when they are able to find the flowers that provided the pollen when they were pips. You can read of the joy they feel when they leave their home high in a tree on a sunny morning. The insight into how they feel about requeening is almost enough to choke one up. I have quoted a passage about this earlier in a message here. No, this is not a beekeeping book. It is much much more, and one of the few books that I would recommend to a seasoned beekeeper who thinks they already know it all. I love this book. It’s a ‘bit out there’ at times, but overall really enjoyed the book. It’s one of the few that I can see myself reading again. It’s not a technical book by any means. More of a spiritual, communing with bees type of book. Jacqueline has a way of writing that truly envelops the reader in the imagery. Love her style. The best book on honeybees ever written. I just finished the book for the first time- there will be many more times I will take this book into my hands. It will be fun to open it randomly and read the words of the bees. It will also be wonderful to introduce non beekeepers to the world of the bees, brining awareness of the interwoven and interrelatedness of our worlds, laid out so eloquently by Jacqueline. 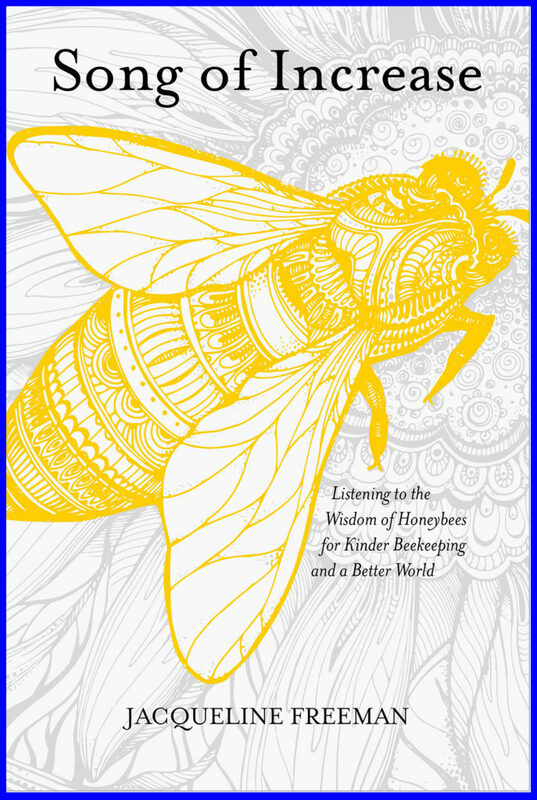 This book offers a nice structure, introducing a new chapter and then let the voice of the bees come through, giving us an insight into their wisdom and sacred mission in our world. If makes my heart ache for every hive that is still enslaved in our practice of migratory beekeeping. No wonder they are dying in great numbers. Every beekeeper has to read this book to understand the spiritual dimension of our craft and enter into an equal partnership with the bee kingdom and nature in general that will be necessary to practice in order to survive as a species- both, bees and humans. This book touched my heart and shook me out of unmindful patterns like none had in a long time. A swarm of bees took up residence in our old maple tree a few years back and though they seem to be thriving on their own, I consider myself a steward. I now have deeper insight into the nature of our sacred relationship. I wish I could give this book more than 5 stars. It is the most beautifully written book about bees anywhere. Bees are sacred and so is this book. One of my favorite fairy tales as a child was “The White Snake,” where a main character becomes able to understand what the animals are saying. Now I read Ms Freeman’s book, and she both tells us her experiences with bees as well as, in English, what she can hear the bees saying. In the chapter “The Sting,” Ms Freeman tells about being stung twice during her time working in a bee booth with a beekeeper who had political ideas opposite her own. After her shift she went home to visit her own bees in hopes of calming herself. “I walked barefoot through the field toward a hive and WHAM! I stepped on a little bee who stung me in the very center of my foot, on the Bubbling Spring acupuncture point–the very first point that forms in the fetus, the one that helps you ground and connect with the earth, the point that roots energy downward. This is exactly what I need to be able to deepen my relationship with my own three hives, hearing the honeybees speaking and then letting the honeybees be bees–allowing them to live in harmony with their purpose. As editor of this book, and friend to Jacqueline, I can’t tell you how deeply moved I have been by this book—but I’ll try. Jacqueline’s work with bees is truly extraordinary and I’ve taken her classes in beekeeping for several years. Yet nothing quite prepared me for this book. The words of the bees are life-changing for anyone sensitive to the rest of Creation, which you must be if you are here pondering whether to purchase such a book as this. What the bees have to tell us is wondrous, deep, and full of real hope for a world gone out of bounds. The bees will bring you back to yourself in a fundamental way, as Jacqueline invites you into the unity consciousness of their amazing world. This is Jacqueline’s first book, but certainly not her last. Rather than an instruction manual on the technical aspects of keeping bees, it is a guided journey into who and what bees are in this world, what they have come to do, and what they have to teach us. You do not have to be a beekeeper, nor a prospective beekeeper to appreciate this book. Anyone looking to expand their relationship with creatures other than human will find gold in these pages. The bees’ words are the soul of this book, but not to be missed are the exquisite stories of Jacqueline’s life on her much-beloved farm. She is not shy about sharing her failures with bees along the way, and her easy, inviting writing style is what makes it so very easy for the reader to absorb new and utterly astounding information about bees and the natural world. As you read, you will find yourself nodding in agreement, perhaps murmuring to yourself, “Of course that would be true!””Song of Increase” is many books in one. It is about bees, and farms, and “field cake,” but it is about much more than that. It is, at its heart, a very spiritual book and it can be read at that level alone—as a sacred text to meditate with and to use as a new kind of spiritual practice. As a superorganism devoted to the success of the whole, the hive has much to teach us about joyful service to a higher calling. This book has the potential to transform beekeeping, and transform the world. Really. I’m serious. Buy it, read it, sink into its beauty and wisdom. You will not be disappointed. I am a beekeeper and a bee educator, speaker, and advocate. I have been talking about the sacred path of bee for sometime and also been following the wonderful work and ways of Jacqueline Freeman for a good while. I have looked forward to her publishing this book, The Song of Increase, for sometime and my first response to finally reading it is: Woooooooooow! This book is fabulous, moving, divinely timed, elegant, eloquent, honest, compassionate … and so completely full of love. It is a jewel. I am absorbed by everything … the title of the book, the chapter titles, Susan’s lovely Foreword, the introductions and then the chapters themselves which are a treasure trove of Jacqueline’s writing and the bees’ messages. I am having a total can’t-put-the-book-down / don’t-want-it-ever-to-end experience. This is true holy-bee-communion and I am resonant with every nano-speck of everything she so elegantly shares with us. In my opinion it is one of the great bee books of our times. It speaks to Relationship with a capital “R” with this Sacred Other that is so precious – the sweet honeybee. This book is real honey. Blessed be. Blessed bees. Blessed Jacqueline. This is by far the most informative book on how bee hives work within the hive, in nature and with humans. Jacqueline has been gifted with this information to bring forth to humanity. Thank you for answering so many questions about how bees work and the why’s. The Universe we live in is soooo much more benevolent than we think. The workings of the bees is so beautifully explained. How humans work co-creatively with bees will now change due to this book. It has taken me a long time to get through this beautiful book. I read each passage repeatedly until I feel I have really been able to take it in as best I can, because the truth of it is overwhelming. I want everyone everywhere to read at least some it, as I know they won’t be able to resist reading more. They must read more because the information shared confirms the goodness of being alive, and inspires us to submit ourselves wholly to our purpose here on earth. There is no pretense of anything else. My endless gratitude to the honeybees, and their devoted human, Jacqueline. Jacqueline’s sensitive and perceptive nature is reflected through her life with bees. She encourages readers to venture further into the new multidimensional territory of honeybees. This book calls attention to the hidden aspects of apiculture and the deeper nature of bees, encouraging us to open our hearts and minds to the bees. This is a timely book in a transitional time for bees and the entire biosphere. I loved The Song of Increase. Beekeeping is a sacred occupation. This book grounds that intuitive knowing and informs my work with bees… the drones singing the song of creation to the babies, the joy of the maiden bees when they find nectar and flowers, the search for the sun as the virgin queen begins her marriage flight. All these images live within me as I interact with the bees, opening my heart and mind to the beauty of life in the hive. As a beekeeper, I find it fascinating to think of someone being able to fully communicate with bees and understand the world from their point of view. But what I loved most was how true the information feels to me too after my years of working with bees. Plus it is really fun to read. The writing is so personal and approachable. I think non-beekeepers would love this book too. It does a lot to correct the thinking that has led to how out of balance our world has become. Jacqueline is on the cutting edge of apiculture with her intuitive, compassionate and intelligent work. She has the rare ability (and courage!) to take us into the bee’s world. We can learn so much from this deeply sensitive book. This is not a book I would ordinarily buy for myself. Just based on the blurbs and pre-pub reviews, I knew it would probably be a bit too “mystical” for my taste. But it was a Christmas gift and so I started to read it out of respect for the friend who gave it to me. I was hooked after the first chapter. I cannot say that I read it in one sitting, because I kept having to put it down due to being a bit choked up at some of the imagery and the pure beauty of the prose. Ms. Freeman understands the nature of life in the beehive, and her ability to tell the story of that life draws out ideas and concepts that have only been subconscious “feelings” to this experienced beekeeper. The book is not a step-by-step “how to” on beekeeping. The beginner will need to look elsewhere for that. But the beginner and the old timer alike will benefit from her observations on management techniques. The book is a bit mystical. It is also poetic and philosophical. But it would have to be a very hard-hearted industrial beekeeper that did not fall in love with this work. Even non-beekeepers will gain from reading it. My time as an intern on their farm remains some of the most inspiring in my heart. Jacqueline has the most genuine and profound connection to honeybee consciousness of anyone I have met or heard of, and I have looked forward to the release of this book, in the mean time carrying personal stories to share, and memories of snippets of this text as it was being written. Thank you Jacqueline & Joseph for being such inspiring people and for sharing your Love with the unified world. I have no doubt this will be inspiring, uplifting, and call on a certain level of impending desire to reconnect with Love thru our connection with Bees in very practical ways we can attend to in our daily lives. I had the privilege of reading Jacqueline’s book just before it went to print, and I loved all of it.As a biodynamic beekeeper, I take a lot of care and consideration in how I interact with the bees. I’m always asking why are they doing what they do, how can I help them. What is here to read is a tremendous value to answering these questions. It provides new perspective about the fundamentals about the hive and the bees that live there. It shines a light on intermediate topics like swarm behavior and the health of the bees. It also contains insights into advanced concepts of how the bee’s role in creation is holistically significant. This is a “CAN’T PUT DOWN” book! One of my Yule gift offerings to our home this year is this book. It just arrived yesterday and my husband and I are both absolutely loving it. It’s just exquisite! I started by just randomly opening the book and did this several times. No matter where I opened it I was captivated by whatever I happened to turn to…and….forced myself to stop so as to both move on to another random peek, as well as to not spoil it entirely when I read from cover to cover. What a wonderful “voice” this book has. Thank’s to Jacqueline Freeman for writing it. I have been called to walk the bee servant path and this book is going to be a wonderful inspiration in that regard. Now I am reading it cover to cover steadily, and have a really hard time putting it down to do anything else! Lovely, poetic and magical. We get so caught up living in a often stressful environment. This book is a reminder to slow down and really observe the everyday magic we have all around us. Personally, I feel Jacqueline has been chosen by the bees to be their voice, and she is a very good listener and conveyor. Industrial chemical bee keepers may have an epiphany after reading this book! Highly recommend this book and not to just bee keepers! This is very good read for any beekeeper old or new. An interesting twist of what the bees know, love & share.